There is a saying in France that those living on the Cote D’Azur have their feet in the water and their heads in the mountains. And, while its resident superyacht owners may be more familiar with the former, there is no denying that there is something quite spectacular about the geography – and therefore views – in this most glamorous of coastal locations. 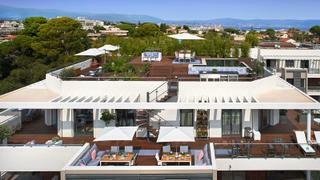 Situated between Cap d’Antibes and Juan-les-Pins, Parc du Cap, the latest prime real estate development from the Caudwell Collection, offers unrivalled spots from which to take it in. 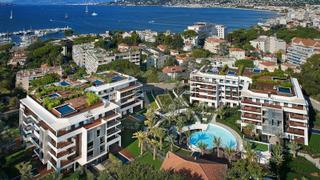 Comprised of 88 luxurious apartments, including ten spacious penthouses, Parc du Cap is the first of six South of France developments currently being overseen by John Caudwell, British businessman and owner of 72 metre LurssenTitania, which include the refurbishment of the famous but currently neglected Le Provençal hotel, expected to relaunch in 2022. The pinnacle of Parc du Cap’s real estate options is a four-bedroom penthouse with wraparound terraces and a rooftop infinity pool boasting 360-degree views. Designed inside by Peter Inston, who was also involved with Titania’s 2011 refit, the open-plan property is finished in elegant shades of cream and grey with fine materials and craftsmanship sourced from across Europe. Residents at Parc du Cap, which is currently 30% sold and largely being used for holiday homes, also have access to a variety of hotel-style amenities. 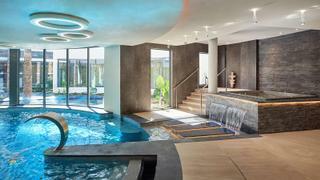 The two apartment buildings are arranged around landscaped gardens, in the centre of which is a large residents' pool, while hidden underground is a second indoor pool, large gym and spa with treatment rooms, sauna, hammam, hot tub and ice room. There are also residents’ tennis courts and secure parking as well as a 24-hour security and concierge team for complete confidence whether you’re home or away. Yachts visiting the Antibes area aren’t short of pretty anchorage options but if you’d rather moor up, Port Gallice is just a ten minute walk from Parc du Cap and offers berths for yachts up to 43 metres while larger vessels can book a berth up to 165 metres in nearby Port Vauban. Music lovers should make sure they’re in town for the annual Jazz a Juan festival which takes place each July – 2018’s headliners included Lenny Kravitz, Nile Rogers, Carla Bruni and Norah Jones. If you’ve already sampled the delights of Eden Roc, head to Restaurant de Bacon for Michelin-starred seafood with spectacular ocean views. 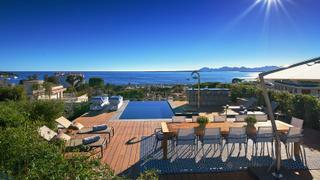 The four-bedroom Parc du Cap penthouse is priced at €7,600,000, caudwellcollection.com.